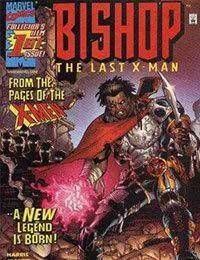 Bishop: The Last X-Man Volume 1<br />Bishops first ongoing series. Mixing the genres of science-fiction and sword and sorcery with one of the X-Mens most popular characters, Marvel unleashes another a new monthly series sure to surprise and delight fans of fantasy!<br />The series was well received, but was canceled due to an editorial decision to produce less X-men related comics, in order to stop the overflow of X-men comics at the time. Among the cancelled comics where Mutant X, Gambit and Bishop: the Last X-man. The series was closed in a mini-series named Gambit &amp; Bishop - Sons of the Atom.